It’s been 200 photos on Sunday, and I’m daunted about how many I’ll actually end up posting. Last time I went photo-berserk, in Berlin, I left it so long I lost interest. So I need to be posting the quirky photos and quirky mistaken observations on Montreal language politics close to the source. It’s 8 AM, I’m in the hotel lobby cafe, because I will not face another hotel breakfast. The first shock in coming to Montreal is, what is this piece of France doing in North America. The second shock is, despite the Language Police purge of English from the streetscape, this is still North America. Witness (A), they serve food like North Americans. I thought I was striking a blow for frugality by having a single scrambled egg and bacon for breakfast, instead of the mountains of meat, egg, potatoes, and bread that the hotel menu was defaulting to. What I got still had the mountains of potatoes and bread. I’m not noticing the lather of maple syrup on top of everything yet, but I may be in too internationale an establishment. But the servings were just as ginormous outside the hotel. This morning was yoghurt granola in a plastic cup, thank you very much. And the granola was still suspiciously sweet. Sunday was probably an optimal time to be out and about in town: it rained yesterday and again this morning, so those 200 photos may have to last me a while. 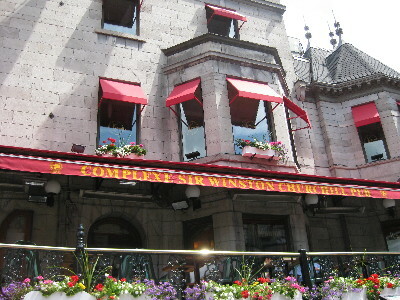 I ended up doing four of the walking tours in the guidebook; I turned back tired before I could start the fifth, up Plateau Mont-Royal. A workshop participant is offering to take me up there this afternoon; haven’t decided yet—I am here on business, after all. As I really should have known, I was naive to trust the language-purged streetscape of Montreal, to work out how the language conflict has played out. I only know a bit more now than 36 hours ago, but the conflict is not yet done. I’d mentioned that I saw red at reports that the current governor general had once toasted secession; but Michaëlle Jean has been doing the right thing since appointed GG, including (a) getting up PM Stephen Harper’s nose, and (b) making it her mission to bridge the solitudes between the two communities. I mention this, because the one thing I did work out in the past 36 hours is, there is still a force field between the communties. In fact, I was fooled by the language police into not realising that I’m staying at the fault line of the force field in Montreal. West Sherbrooke St was Anglo where rue Sherbrooke Est was Franco; because of the language purge and the mellowing out of tensions, I assumed that was all ancient history and the split down Sherbrooke didn’t matter. The workshop I’m attending is at UQAM (Université du Quebec à Montréal) on rue Sherbrooke Est, and I certainly didn’t notice a border checkpost or a force field in the 1 km between them. Which gives added dimensions to this photo, on a swanky fashion shop on West Sherbrooke. 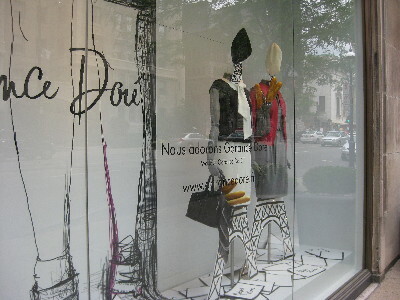 The way I’d read the display, Garance Doré may be a French fashion house which the trendy quebecqoise adorent; but Montrealers still caricature Parisians with berets and baguettes, just like the most clueless of Americans do. This heartened me: it told me that Franco-Quebec asserted a Franco identity rooted locally, not pleading for direction from the metropolis. That they could poke fun at Paris, instead of prostrating themselves before it. I think my take is basically correct: after all Quebec prides itself on having a more purist French than Paris does, so they are more Catholic than the Pope. And being more Catholic than the Pope is not a sign of venerating the Pope. There’s an obvious reason why Quebec needs to be purist in its French, and deride France for allowing le parking into the language. The encroachment of English into France is still mostly a matter of wounded prestige; the encroachment of English into Quebec is closer to a matter of survival. Of course, Quebec service staff still respond to merci bien with bienvenue!, which is that most American reflex response you’re welcome! in French clothing. But that’s the thing about purism: it’s all about the morphological clothing, not the calquing. Just as when the Greek purists thought they could help revive Ancient Greek (as Psichari memorably lampooned), by rendering French journalistic clichés like prenant en consideration que or entre la poire et le fromage or tous proportions gardées in Greek with Classical genitives. But the fashion display with the berets and baguettes was on the anglaise maudite side of the force field. Was this a franco shop, gently reminding the world that it was not prostrated towards Paris? Or was this an anglo shop, subverting the requirement that Nous adorons has to be double the size of We love? Much harder to tell. I know you're like, zombificated and all by the time change, but there is one more u in quebecquois(e) than you are managing to get in there….